Pickleball players can connect with other players and arrange to meet at the Club on the weekend. The courts are open to both tennis and pickleball during the afternoon. Playing pickleball outside during the spring, summer and fall months is a wonderful way to stay active and socialize. 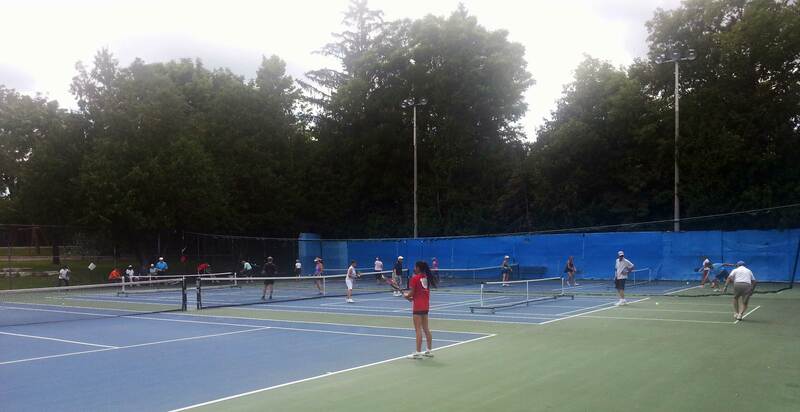 Enjoy playing in beautiful and historic McMahon Park, on cushioned courts and access to full amenities in the clubhouse. Drop in to play at the time listed above. Ideally, arrange with some friends to meet you at the pickleball courts. Pickleball is a social game so there is a constant mixing up of players on our 2 courts. Let people know that you are just learning. Most often, informal instruction is given by more experienced players. The nets are already on court # 3 (end court). If you are first to arrive you can pull the divider net across court #3 so that any balls from tennis players don't interfere. There is a pickleball equipment bag in the clubhouse and extra paddles and balls if you need them. Go to the Registration page to register online or fill in the membership form. Pickleball players, are you new to the club? Maybe you were a member last year? Regardless, you are invited to celebrate the official opening of the 2017 pickleball season. Our opening day celebration will be announced soon. There will be a free bar-b-cue event hosted by the ACTC Board of Directors. Courts #1 & 2 will have tennis and court #3 is dedicated to pickleball. If you are new to pickleball, we will have instructors on hand to help you learn to play the fastest growing sport in North America. Beware, pickleball is an easy game to play and is addictive. On opening day we also accept in-person registrations. Board members will be present to answer questions about all our programs for 2017. Procedures - Nets - Clubhouse - Shoe Tags etc. Drop in to play at the times listed above. Ideally, arrange with some friends to meet you at the pickleball courts. pickleball is a social game so there is a constant mixing up of players on our 2 courts. If you are new to pickleball, let people know that you are a beginner player. You will be matched with players at your level. Also, informal instruction will be given by more experienced players. For new pickleball players I encourage you to come out after May 15. The weather will be warmer and more opportunities to play. Returning pickleball players may choose to come out in the first 2 weeks of May. The pickleball nets are already positioned into the fence on court # 3 (west court). You lift the end of the pickleball portable net and wheel it into position on the court. Look for the pickleball net marker to position in the net in the right spot. There are locks on the end legs that secure the pickleball net in position. There are divider nets between court 2 and 3. You can pull the divider net across to stop any balls straying between courts. There is a pickleball equipment bag in the clubhouse and extra paddles and balls if you need them. Shoe tags will be available throughout the year. The shoe tag identifies you as an active member of the Pickleball program. When players are finished for that particular day, we ask that you move the nets back to the side of the fence. You lift one leg of the pickleball nets through the hole in the fence and push the nets flush to the fence. The United States of America Pickleball Association has an excellent list health and safety issues for pickleball players. It's a must read for all players starting out or have played pickleball for some time. Proper shoes, warming up, staying safe on the courts, cool down after games and many more tips can be reviewed. Over 30 members attended our opening day social. We had several new people come out that never played pickleball. The Pickleball Committee hosted a free delicious barbecue that everyone enjoyed. 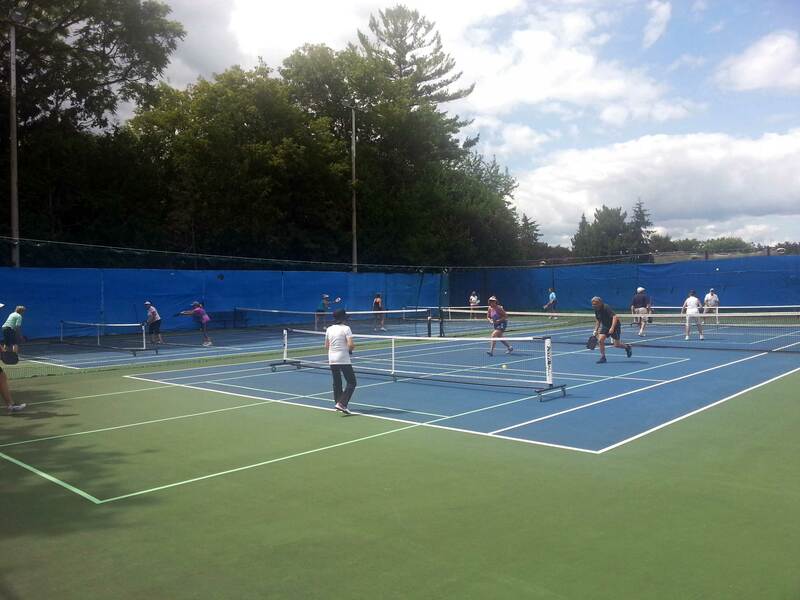 On Friday August 4th, we enjoyed some beautiful weather for pickleball. For the first time this summer we taped 4 courts for 28 players that came out to enjoy pickleball with old and new friends. With almost 60 pickleball members registered, the Pickleball Program Committee is feeling confident that we are reaching new people unfamiliar with pickleball and also attracting current players who like the pleasant outdoor environment and resources at the Aurora Community Tennis Club. This turned out to be an outstanding day organized by our Pickleball Committee. We had 36 pickleball players turn out and 9 new members joined our Pickleball Program. We had experienced players on hand to offer instruction. Prizes were given out to 6 participants. A wonderful lunch was hosted by the Pickleball Program Committee. We look forward to many more such events over the summer and in the future. The slide show will give you a small taste of the fun everyone had. What an outstanding day. The weather threatened but we played on. A great mix of Pickleball and tennis combined with an outstanding barbecue lunch hosted by the Board with support from volunteers. Here are a few slides to show you how the day went. Please note how much fun the junior tennis players had on the Pickleball courts. Thanks to Annette and John who helped the youngsters and older tennis players learn how to play Pickleball.